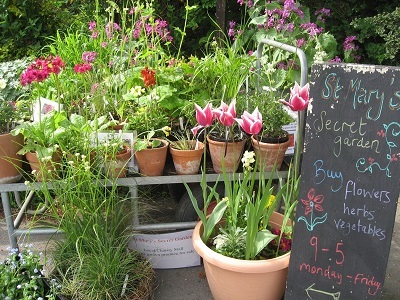 Plants are available for sale Monday – Friday 9am – 5pm and we are very happy to answer questions and give advice. We accept payments by cash or all major credit cards. Plants are sold subject to stock. Many are grown from seed using organic methods by our service users. New plants are added all the time and unusual varieties appear in our plant sales areas. Introductios for this year include such plants as Leucanthemum spellbook lumos, a yellow shasta daisy, very attractive to bees. Download a full list: New plants coming for Spring 2019. All plants and vegetables are maintained and prepared by the clients, learners and volunteers who come to the garden. We do not use chemicals to care for our plants, instead we make our own compost and fertiliser from our green waste, worms and from the comfrey plant which grows here. Jams and chutneys are made by the gardeners from produce grown here, some of our best sellers are blackcurrant jam and rhubarb and ginger jam. When it comes to chutneys then you must try our spiced carrot & ginger, as well as the marrow and apple chutney. Prices range from £3.00 for a small jar to £5.00 for a large jar. Seeds are collected in the summer and autumn. They are placed in bags and available for sale from 50p. Scented bags and pillows filled with lavender and other herbs from the garden from 70p. We have had some rises in core costs e.g. compost and delivery prices – but we are recycling plant pots to reduce other costs. Download our Plant Prices list for details of our charges for perennials, annuals, bedding, herbs and vegetable plants, together with compost, fertiliser and various gift items.